This is the third and final book of the Inn BoonsBoro Trilogy. While all of the books can be read as a standalone, there is a plot thread about a ghost haunting the inn that is delightful and best if read from the beginning. In this tale we get the last Montgomery brother's romance, and boy howdy they saved the best for last. Ryder is handsome, rugged and a little anti-social. Since day one he hasn’t really liked the innkeeper, Hope Beaumont. She smells like city and wears those pencil thin heels. Or maybe he protests a little too much …. I loved the small town setting and especially the Inn. The Montgomery family is wonderful and I adored all of the brothers and their antics. While each is stubborn in their own right, together they are a force to be reckoned with. The banter between Hope and Ryder was priceless and this book made me laugh, giggle out loud and even cry. I really enjoyed the paranormal thread in all the books about Lizzy the ghost. Her history and the role she played in the three Montgomery brother’s romances was so much fun. Who doesn't love a mischievous ghost with good intentions playing cupid? The inn’s history and Lizzy’s tale captivated me almost as much as the romance. I loved how Hope peeled back the layers of Ryder’s tough exterior. The romance felt genuine and developed slowly, making each advance that much sweeter. In the end I was happy but sad to see this trilogy come to an end. I recommend The Perfect Hope and the entire Inn Boonsboro trilogy to fans of small town romance. 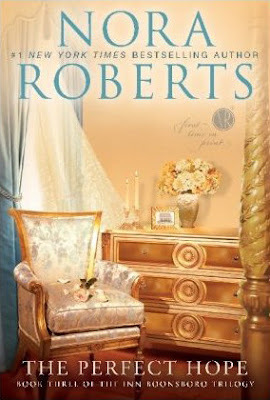 Nora Roberts is one of my favorite authors and delivers books from mystery to paranormal with a healthy dose of romance. I do not think I've ever read a book of hers I did not enjoy.